The BRS Series System is designed to provide back-up gas supply where gas generators, compressors or house line gases are the primary source of process gas. 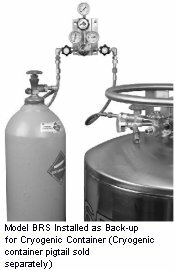 The BRS Series allows supply systems to be turned off for service or maintenance without disturbing the gas flow or pressure to high purity applications. Unlike changeover systems, the Advanced BRS System automatically provides back-up gas on an as needed basis, buffering deficiencies in supply pressure. 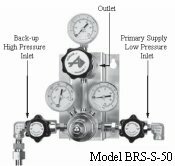 The system activates (backs-up) when the supply pressure drops below the BRS preset pressure and deactivates when the supply pressure rises above the preset pressure allowing for the primary source of gas to flow. Monitoring or operator adjustments are not required during the back-up activation or deactivation. The BRS System design incorporates a two-stage regulator, line regulator and in-line check valves. Diaphragm seal valves allow for either supply pressure isolation or cylinder isolation when a change of cylinders is required. Available in either brass or stainless steel construction, they are supplied entirely installed on a stainless steel panel providing for convenient, wall-mounted installation. The overall compact design allows for installation in areas where space is at a premium. Allows main gas supply to be turned off for service without disturbing gas flow to application. 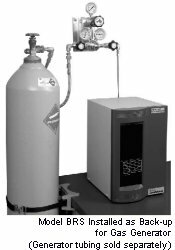 High Purity Diffusion-Resistant Regulators minimize the diffusion of air into the system, maintaining the purity of the gas. Diaphragm Seal Isolation Valves allow for complete isolation of the gas source when making a changeout. Check Valves prevent backflow of gas from regulator and pigtail. Note: Pigtails for the primary low pressure inlet connection are available. Contact your Advanced Representative for more information.